I have been revisiting some of the designs I completed while working in architectural firms in the last year or so. The idea is to look back and assess the common themes of my work, update some of the more relevant themes, and at rare times to retroactively reverse some of my more utopian positions. Bonnie Foit Albert hired me to work in her firm in 1999 after completing an adaptive reuse studio at SUNY Buffalo. She told me about three months into my job that she hired me because I was one of the only students interested in doing a pro forma for my studio project. (A pro forma is one of several ways of estimating the cost of your design project.) My first project in the firm was to complete a conceptual design for a ‘Family Life Center’. These types of projects were being completed by Baptist Churches all over the United States. Their purpose is to provide social services for those in the congregation and the local community. I was able to meet with the head of the congregation during my tenure at Foit-Albert Associates, which was an excellent experience. Here is a little background about the Baptist church I served during my time at Foit-Albert. Established in 1927, St. John the Baptist Church considered itself a prominent example of what faith and perseverance could provide for African Americans. Over the years, this congregation has persistently supplemented its religious mission with much needed communal activities including a local credit union, a charity mission, and an elderly housing complex – all on the grounds of their church building on Goodell Street (built in 1969). By the 1970s, Reverend Bennett W. Smith, Sr. became responsible for much of the increasing building campaign conducted by the church. It was Smith who approached Foit-Albert Associates in 1999 to design a new complex for their church. This complex was designed take care of someone ‘from birth through death’ by housing a day care center, a primary school, and support services for a nearby elderly housing tower. While open to any architectural approach, Bennett insisted that a black intern be found to create the design. As I had recently joined the firm, I was given the opportunity of creating a conceptual design for the project. The initial design parti was simple – confine the main program within a platonic mass and use this mass as an anchor for additional features that gestured toward prominent features of the surrounding context. I also wanted to frame the site with the existing church buildings on one end of the parking lot and the Family Life Center on the other. The three-storey gymnasium served as the heart of the main building: it would be used for both school and neighborhood gatherings. My time at Foit-Albert Associates was short. I was not able to stay in the firm through the subsequent phases of the project’s development. As the design process progressed, my initial design lost some of its character. For example, the building was always intended to be completed with a simple palette of brick, concrete, and steel to emulate a straight-forward modernist approach to construction. To save costs, however, metal paneling was eventually used for most of the front facade and a faux-masonry pattern was impressed into the concrete along the building’s side elevations. Despite attempts to color the concrete to match the brick of the main church building, the final building looks a bit wonky. I also think that some of the interior space programming was changed as well, which is inevitable in most architectural projects. The major addition was of an elevator (which was not required by code, but probably made the design more efficient), which dramatically changed the overall massing of the project. I don’t consider this attempt to be a complete failure, but it definitely was a good learning experience. Moving from the idealistic space of the academic studio to a real-world project was enlightening to say the least. In the last year or so I’ve revisited the overall details of the design. 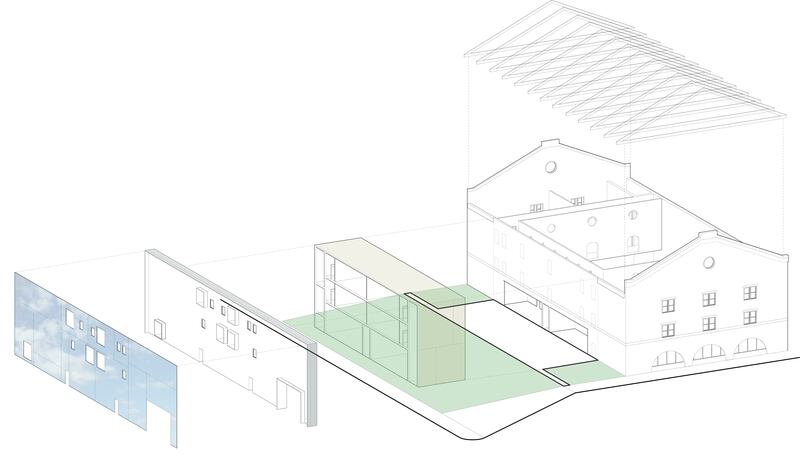 Keeping the primary conceptual approach to the parti, I decided to conceptualize the primary mass of the building with Romanesque brickwork, which recalls the industrial history of the city. A prominent feature of this brickwork is the ground floor arches that open up onto the parking lot. These material features echo the concrete arches found in the modernist addition to the original church building that sits directly across the parking lot. These two arch details frame the parking lot as a unified space. During religious services, the parking lot directly serves the congregation. During the day, however, it doubles as an informal community market. Existing condition of brick addition to main church building. Note the barrel vaults projecting toward the parking lot. 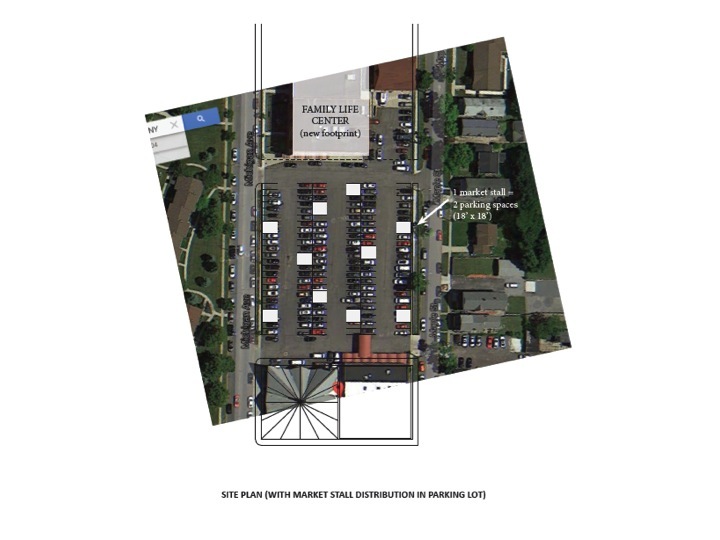 Site Plan with Market Stall distribution in parking lot. Axonometric of project with market stalls situated within parking lot. Each stall is clad with the translucent panels used on the tectonic feature of the main building. This material choice should create a sense of continuity between the main building and the parking lot. Exploded axonometric of the Family Life Center showing the (1) main brick mass with ground floor arches, (2) copper clad classroom block, and (3) tectonic wall feature along main street. 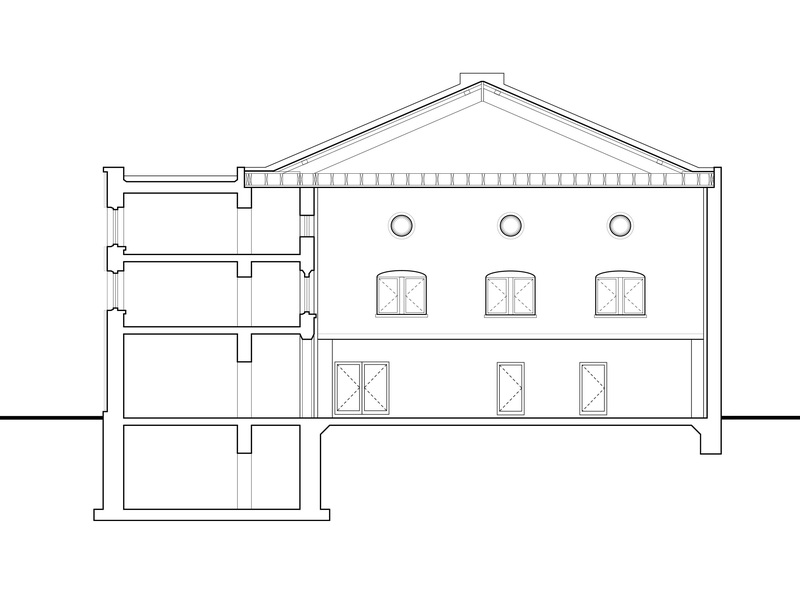 Main building elevation study. Note the pronounced arches on the front facade. The brick detailing is meant to emulate the Romanesque corbeling used in turn of the century structures. 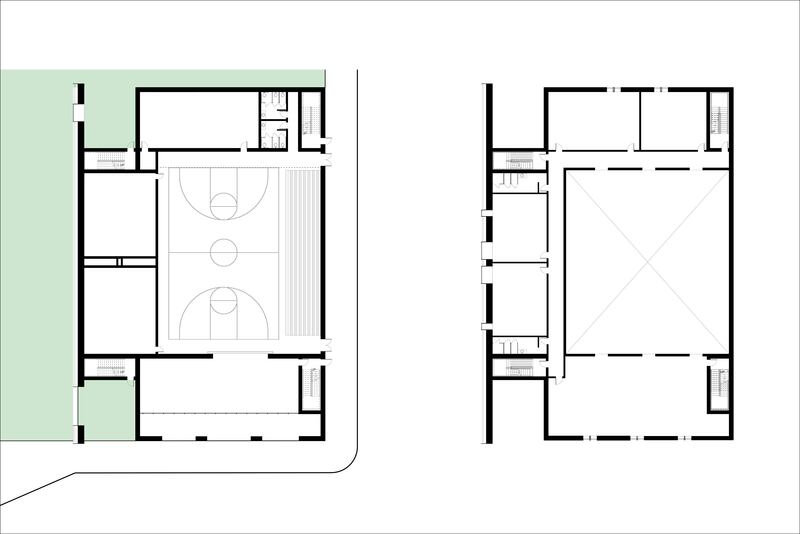 Ground floor plan and typical second/third story plan. The gymnasium rises the full three story height of the complex. Transverse section through the project. The three-story space is a gymnasium with windows overlooking from the upper two floors. The hallway and classroom sections are situated behind the tectonic wall situated along the main street edge.